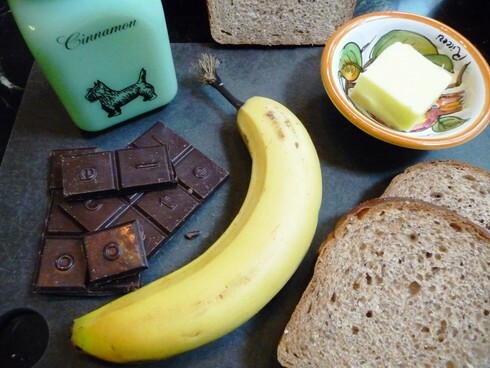 These chocolate-banana-cinnamon paninis are favorites of ours. We have them a couple of times a month for breakfast, usually on the weekend. We like to use rustic bread from the farmers market, along with Askinosie chocolate. Slice the bread into 1/2″ thick slices. Sprinkle the chopped chocolate on top of two slices. Place pieces of banana over the top of the chocolate. Top with the remaining slices of bread. Brush the top slice of the bread with butter. Sprinkle generously with cinnamon. 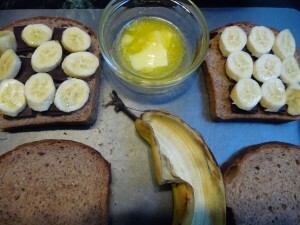 Carefully invert the sandwiches and place them on top of the panini-maker, cinnamon side down, being careful not to disrupt the chocolate and banana inside. Brush the top slice of bread with butter and sprinkle generously with cinnamon. Grill on the panini-maker until the chocolate is melted and the sandwiches are golden brown. Remove and slice in half. Serve immediately. There goes those fabulous Askinosie chocolates you’ve raved about Those pananis look like a great comfort food.